Karl Seibert photographed the flames on a diesel behind the police station and the Roche Center in West Roxbury around 2:20 p.m. Took some video of firefighters clambering on the engine. There is no passenger service on the line on Sundays. Kerry O'Brien is on a Needham Line train with no heat, no light and no open seats. On the bright side, it is moving. Around 8:15 a.m., Kerry O'Brien reported an inbound Needham Line train was so crowded people at Roslindale Village couldn't get on. 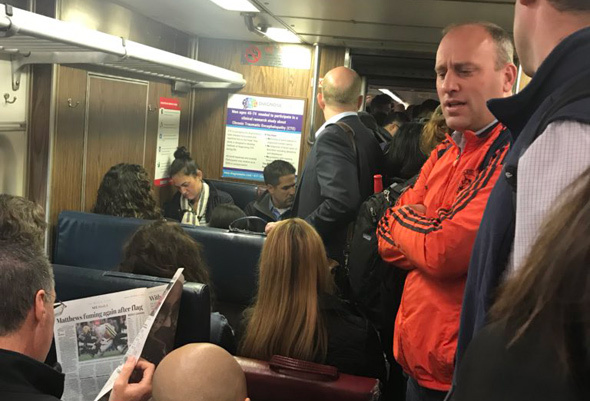 So Keolis had to cancel the 7:32 a.m. train out of Needham for some reason, which meant the next train into town was packed with two trains' worth of people. And, Kerry O'Brien reports, no air conditioning. Read more. The MBTA is blaming "an Amtrak switch issue" at Forest Hills for massive delays on all the lines out of South Station that use the Northeast Corridor. 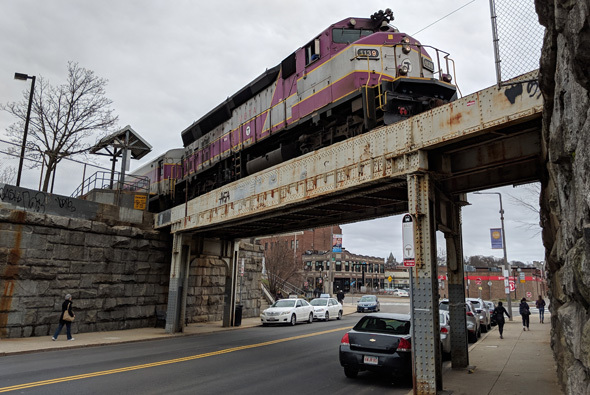 MassDOT reports that 48 spaces at Needham Junction will no longer be available to commuters come Monday: Read more. 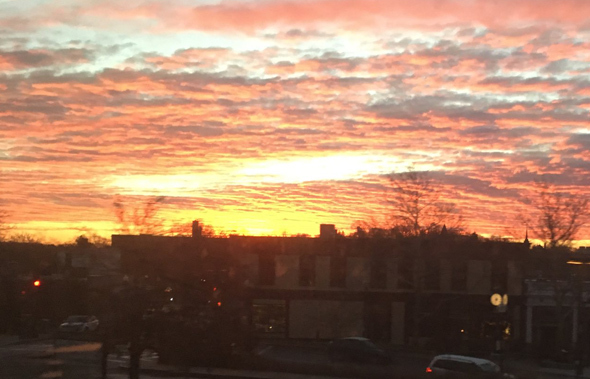 At 3:38 p.m., Mikhaela Houston tweeted from onboard a train to Needham that is just sitting at Bellevue on the Roslindale/West Roxbury line: Read more. Bodies packed tight, including in vestibules between cars. Unsafe, uncomfortable. Illegal? 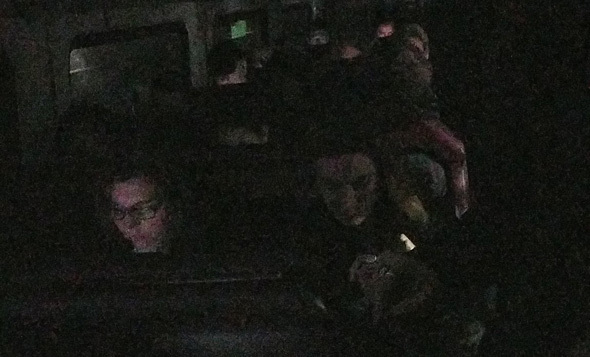 Train just left Ruggles with dozens unable to deboard, trapped on train. No one around to hear shouts. 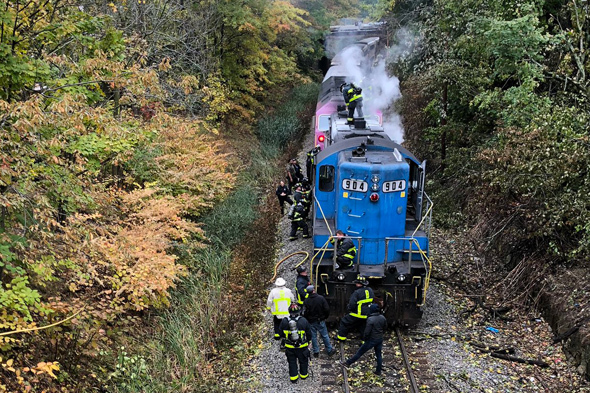 Photo by Needham Fire Chief Dennis Condon. 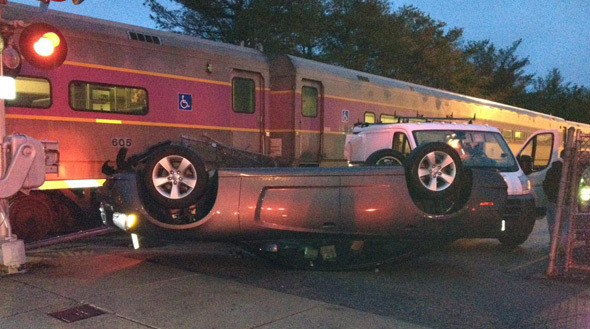 Somebody parked their formerly expensive car just a little too close to the tracks at the Needham Heights station this morning and a Needham Line train took exception and flipped that puppy upside down. One train was canceled and others were delayed, although things were mostly back on track by 8:20 a.m. or so. Franklin Train 722 (5:04 pm inbound) has departed Forge Park/495 & is operating 50-60 min late due to the rescue of disabled Train 720. Boston Magazine reports the shih-tzu lost a leg and about 40% of its blood after being hit between Roslindale Village and Forest Hills last Thursday, but is now recovering nicely as the MSPCA puts her up for adoption.